17a. [Santa player in “The Man in the Santa Claus Suit”] FRED ASTAIRE. 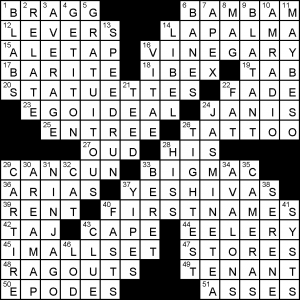 26a. [Santa player in “The Polar Express”] TOM HANKS. 40a. [Santa player in “Elf”] ED ASNER. 62a. [Santa player in “Miracle on 34th Street”] EDMUND GWENN. It’s like a SantaCon in the privacy of your own home! Just add booze and loutishness! What’s that? Haven’t had enough yet? 4d [Right jolly __ |duplication of 40a clue| (Santa)] OLD. 59d [Sitting spot for a child visiting Santa] KNEE. 24a [Something sent to Santa] LETTER. 60a [Mincemeat __ (Christmas staple)] PIE. I hasten to add that there were many more opportunities—relatively judiciously uncapitalized-on—for Yule tie-ins. 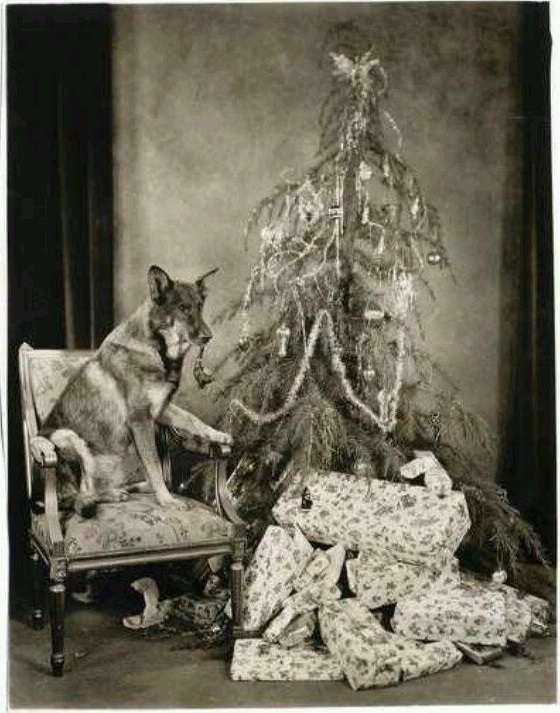 You know, like 9d [Gift tag word] FOR, and 61a “RIN Tin Tin and the Christmas Story” (Season 2, Episode 16, 23 December 1955), and 1d [Horrific] AWFUL. 18d/58a [“Yeah, why not!”] SURE, OKAY. 70a [Past or present] TENSE, 56d [Taste or touch] SENSE. Nifty. New-to-me portmanteau: 34d [Neologism for an on-screen.off-screen relationship] SHOWMANCE. Least-favorite entry: 20a [S.E.C. school near Atlanta, for short] UGA. Ugh. Would have been more elegant to eschew other film actors from the puzzle, regardless of whether they’ve played Santa Claus. 35a [Joe of “Goodfellas”] PESCI, 6d [Show on which John Candy and Eugene Levy got their starts] SCTV. Nice stacked nines in the upper right and lower left: INSINUATE/TRICKSTER (naughty), FACSIMILE/SHOWMANCE. Ho, ho, ho, and a bottle of rum. Very straightforward theme here. Paired words; the second is the spelled the same as the first but with a central consonant doubled. I’m sure we’ve all noticed these in our experiences. Here, they happen to be gathered for a purpose. nb: This is an orthographic and not a phonetic mechanism. 20a. [Pilfered German fruit bread?] STOLEN STOLLEN. 32a. [Evidence of Russia’s currency collapse?] RUBLE RUBBLE. 42a. [“Mister Ed” dot?] TITLE TITTLE. 54a. [Final course in the Sahara?] DESERT DESSERT. There are about half a dozen entries that don’t feel Monday-appropriate (YEGG, BREI, ERLE, SPUMONE, et cetera), but their crossings are mostly a breeze, and the puzzle as a whole is an untroubling solving experience. 11-down [Keyboard work for two] PIANO DUET, which can be either for four hands on one piano, or two hands on each of two pianos. And, coincidence! 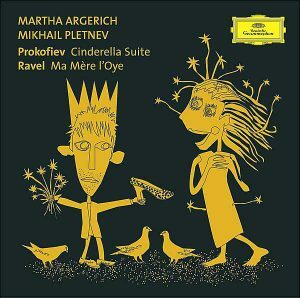 As I type this the radio is playing Ravel’s Mother Goose Suite (Ma mere l’oye), specifically the version illustrated at right. Therefore, in the phrase PIANO DUET ‘duet’ may refer to the players, the pianos, or both. So what the hell is this? Repetitive theme today where the entries follow the pattern THE [person] IN [color]. 19a [Johnny Cash nickname] THE MAN IN BLACK. Also the nickname for Westley as he plays the part of the Dread Pirate Roberts in The Princess Bride. Also the nickname for a character on Westworld. 36a [Classic Wilkie Collins novel] THE WOMAN IN WHITE. I don’t know the book though it’s highly regarded and is considered one of the first detective stories. 54a [Police, informally] THE BOYS IN BLUE. Of course on the whole, police officers are predominantly male, but I doubt this nickname is appreciated by female members of the force. With only three themers and those being very repetitive, I didn’t find the theme very interesting. (Plus, there’s no GIRLS to go with the BOYS.) I suppose it’s a good puzzle for newcomers, though. Most of the fill is very good: “SO CLOSE,” SEA COW, THE CLASH, WALK ON AIR, SEDUCTIVE. But there are a couple of grumble-worthy entries that sap some of the fill’s strength: SENTA (24d, [Berger of “Major Dundee”]) and RECLEAR (48a, [Find not guilty in a second trial]). Yeesh. I’m going to leave it at that. Some strong fill makes it interesting, but the theme fell flat for me. Good afternoon, everybody! 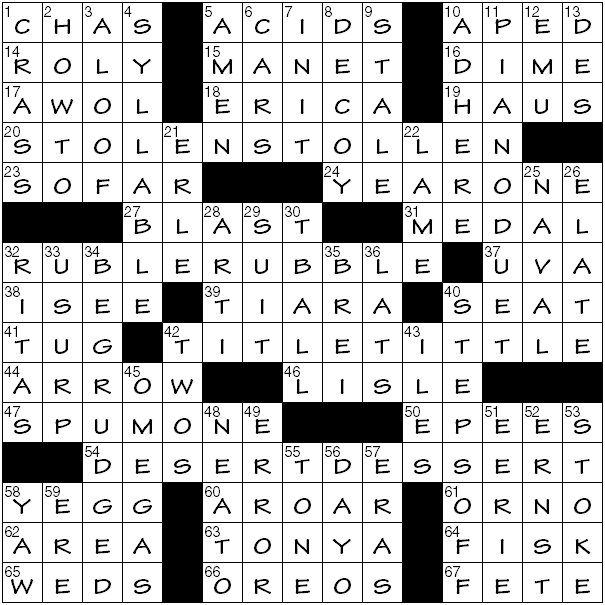 I hope you’re all doing well and that you’re recovering from yesterday’s Puzzle Mania that appeared in the New York Times yesterday. (I was in transit most of yesterday, so I, unfortunately, wasn’t able to pick up a copy.) But we do have today’s crossword, though, which was brought to us by Ms. Lynn Lempel. In it, the letters “G-R” are added to common phrases/nouns to create puns. SNOWY GROWL (17A: [Sound from a beleaguered winter shoveler?]) – Snowy owl. TAKE IT GREASY (27A: [“Here’s your bacon, straight from the fryer”?]) – Take it easy. SIX PACK GRABS (44A: [Results of a sale on beer?]) – Six-pack abs. Best theme entry of the four. HAIRY GRAPE (59A: [Unappetizing bit of fruit?]) – Hairy ape. Any time I see CONAN in a grid, even if it refers to the late-night talk show host, I always think of the character played by Arnold Schwarzenegger (2D: [O’Brien of late-night TV]). Now, Ah-nold is hosting the reboot of the latest Celebrity Apprentice. I’m guaranteed to watch a grand total of two minutes of the new season, doing so when I’m channel surfing and accidentally happen to be on NBC at that time. 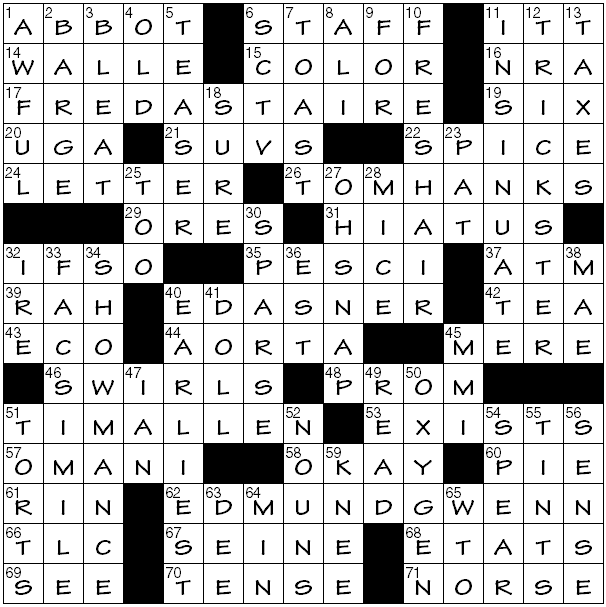 Loved all of the opportunities to talk about sports in this grid with the entries, whether it be because of seeing PIRATE (6D: [Long John Silver, for one) or YOGI BERRA, which was fun seeing his entire name in the grid (33D: [Oft-quoted Yankee legend]). Here’s a perfect example: In Game 7 of the 1960 World Series, Pittsburgh PIRATE second baseman Bill Mazeroski hit the game-winning, series-ending, walk-off home run to defeat the New York Yankees in the Fall Classic’s deciding game, 10-9. The homer went over the left-field wall at Forbes Field, and YOGI BERRA, known for many years as a catcher for the Bronx Bombers, was the left fielder for the Yankees in that particular game, and was the Yankee who saw the ball go over the wall to end the series. How’s that?! Or, how about this: the late Don Zimmer, former Chicago Cubs manager and longtime bench coach and righthand man for Joe Torre’s New York Yankees championship teams in the 1990s, was nicknamed POPEYE (45D: [Noted spinach devotee]). I could continue with about three more entries in today’s grid, but it’s time to head out to cover some Monday Night Football in person in the DC area. “Sports will make you smarter” moment of the day: ICING (28D: [Sugary topper]) – Two years ago, the National Hockey League, in an attempt to reduce injuries caused from specific types of collisions on the ice, modified the ICING rule, the violation called when a team, in an even strength situation (same number of players on the ice for each team) shoots the puck from their own end to the other end but not into the goal. Instead of having the team have to touch the puck for the violation to be called, which at times led to races to touch the puck first that led to injury-causing collisions, the NHL instituted “hybrid icing,” where the race to who gets to the puck first terminates at the face-off dots in the defensive zone, not the goal line. Except for die-hard hockey fans and other knowledgeable sports fans, this explanation just made absolutely NO SENSE! If so, no worries! Carry on. Thank you for your time and have a good rest of your day, everyone! This entry was posted in Daily Puzzles and tagged Brendan Emmett Quigley, Jason Mueller, Lynn Lempel, Martin Leechman, Mike Shenk. Bookmark the permalink. Cheers for the Christmas puzzle – but can we keep it up all week? Showmance was a new one to me too! Other similar constructions: UVA for University of Virginia and UVM for University of Vermont. UVM and UGA are waaay less familiar nationwide than, say, UVA, UT, USC, UCLA, OSU, MSU, NYU, and LSU. I’m not sure of the basis for your assertion. Grouping UGA with UVM is waaay unfair. UT can mean Texas or Tennessee. OSU does not always refer to Ohio State, either. WSJ – Reclear? “Yeesh,” to quote Jim. Maybe in defogging windows or as a busboy, though neither would be very good. But as clued, if you’re found not guilty in the first trial, I thought the double jeopardy clause (in law, not the game show) precludes the prosecution from a second crack. To any lawyers in the group, how about it? Is there a situation where this could happen? Not that I can think of …. at least not where a trial is involved. Dang. I just tried to edit that reply but it vanished into thin air. Anyway, there is a scenario based on successive state and federal prosecutions for the same act that do not implicate the double jeopardy clause. Not common, and “reclear” is still an ugly weord. The only way around the double jeopardy clause is if the second trial is on a different cause of action, e.g. if a state tort claim is recharacterized the second time around as a Federal Civil Rights violation. It depends what you mean by “SAME crime.” There were people acquitted in state court of lynchings down south who were then prosecuted for violating the victim’s civil rights. It is not defined as the same crime, but it was the same act, and the critical point was that the prosecutions occurred under different jurisdictions. Civil rights is the key word. OJ was found guilty of that. Murder is a different crime. I should have spoken more precisely. If we are talking about civil, rather than criminal trials, a second trial on the same claim would be barred by the rules of res judicata, or claim preclusion, the civil analogue to the criminal concept of double jeopardy. An attempt to relitigate a previously litigated *issue* could be barred by principles of collateral estoppel, or issue preclusion, though this gets a bit too intricate to go into further. You can bring a Rule 60 motion in most states to reopen an already decided case based on newly discovered evidence, in order to prevent a fraud on the case or the court, etc. Suppose someone claims to be a licensed denturist in a case in which the issue is whether he did proper denturing. He wins the case, but then in a separate proceeding is found guilty of practicing denturism without a license. The original court could entertain a Rule 60 motion to reopen that case. As to double jeopardy. many defendants are retried when the original trial resulted in a hung jury. That is not a case of a verdict of guilty or not guilty, so it is not a true answer to the question posed, but it can and occasionally does lead to a new trial. Also, in motion practice in criminal matters, defendants will frequently see the dismissal of the case against them during motion practice: the dope was obtained through an illegal search and seizure. The prosecutor will sometimes obtain a reversal of the decision on the motion leading ultimately to a trial on the merits. The key for this topic is that a motion is not a trial. SCTV is my all-time favorite show. The hardest I have ever laughed was the show’s spoof of the Godfather’s iconic horse scene. In the spoof, the horse is Mr. Ed. Huge fan of SCTV. Would like to find this Godfather scene! I have never been able to find that episode. There are a few episodes on youtube, but not that one. You can buy DVDs of all the episodes and there may be streaming sites, but I have never used one. One year, my friends bought me one of my favorite possessions: a copy the Great White North album with Bob and Doug Mckenzie, another classic creation. 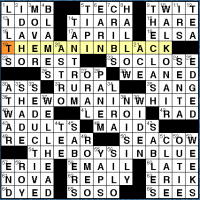 Underrated NYT puzzle, to my mind. I like it because of the movie actors and the quantity of theme material. 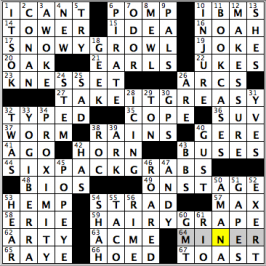 I think that this type of holiday or tribute puzzle is chronically underrated, and that there was very little “glue,” although what that means depends on the solver. As for UGA, I normally dislike school abbreviations because I don’t know them. I don’t follow college sports. I had to look up S.E.C. just now. 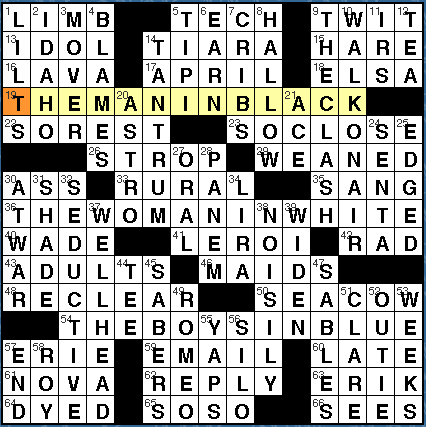 But the clue was really easy for the Monday solver. It says “Atlanta” right there, so what’s so hard about UGA?